From the quay, Planet Nine all but obscures the sight of Mount Vesuvius, which looms over the Gulf of Naples. 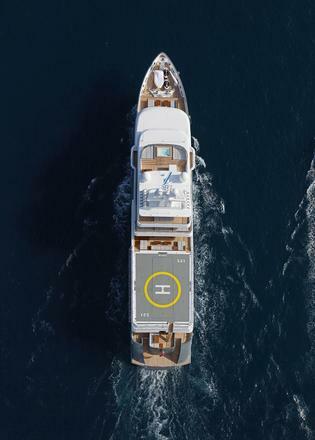 With her high bow and broad helipad aft, she appears the very essence of an explorer yacht: purposeful and uncomplicated. Elegant, for sure, but designed for more serious cruising. Ice classified 1D by Lloyd’s, Planet Nine has been built with thick hull plates, strong frames and bulkheads, and careful protection for her seawater intakes, to protect them from ice and the very cold temperatures encountered in high latitudes. “That is why the owner went to a shipyard [to build the hull], not a yacht builder,” says Williamson. It means she can deal with sea ice up to around 15 centimetres thick, making charters to Greenland or the Graham Land peninsula of Antarctica a possibility. To ready her for Antarctic waters, the helipad has been very carefully designed with a lifting platform, so that the aircraft can be stowed away safely in a hangar when not in use. What this means is that the yacht can accommodate two choppers – one in the hangar and one on deck; so there will always be one free to take on board an ice pilot, for instance. “We can effectively operate a heliport,” says the captain. “Guests can arrive by chopper, while the owner’s machine is on board.” And not just any chopper, either. The design team chose to scale everything to fit an AgustaWestland AW109 Grand – preferred for its large seven-passenger capacity. 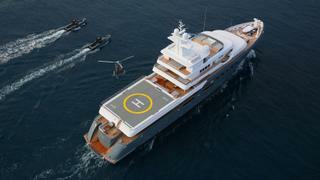 It also has a maximum weight of 3,175kg, so the helipad has been designed to support at least 10 tonnes. The boat’s current helicopter is an MD Explorer 902. 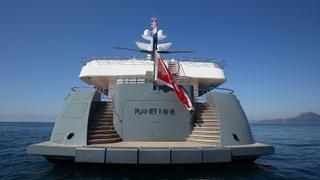 At 73.2 metres overall, any yacht would be impressive enough in its own right. Add in high latitudes looks and there is really no need to go over the top on the design. With an experienced owner taking a close interest, Heywood responsible for the lines and London-based studio Mlinaric, Henry and Zervudachi (MHZ) styling the interior, Planet Nine is a study in purposeful restraint. “The client was looking for a 73 metre world cruising yacht with a crisp, timeless style in the design language of another of my designs, the motor yacht Ice,” Heywood explains. “I am extremely pleased with the proportions of the yacht, the overall form and the subtle sculptural features.” He singles out the trademark wing stations and mast structures, not too big, and the forward roof shapes. “All have been built as I imagined. 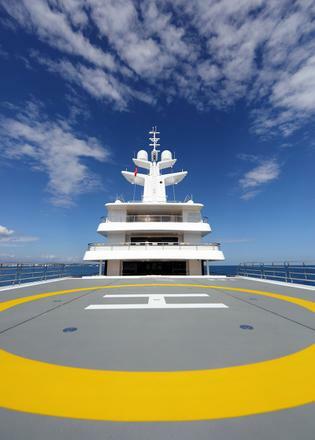 “There is a really harmonious balance to the way the helipad and hangar have been accommodated using the same exterior styling as the main guest decks. The superstructure is a relatively modest three-storey affair, but huge volume has been created within the hull’s tall topsides. All the tankage and machinery have been relegated to a single technical deck below the waterline. “By putting the engine room on what would traditionally have been the tank deck, we have completely freed up the lower deck,” says Williamson. Nearly the entire main deck above is given over to the owner’s suite of rooms, which total an agoraphobia-inducing 250 square metres. These include a huge bedroom with acres of sofa space and a pop-up television (the owner tolerates rather than embraces television so everywhere on the boat screens retract into elegant wooden pedestals). 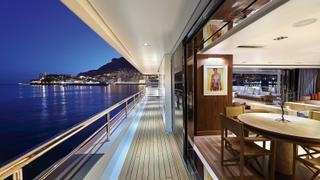 Sliding doors give access to the side decks, which are in use only for docking manoeuvres and therefore largely private. Then there’s a library and conference space, lined from floor to ceiling with books, a further double bed and a separate office. 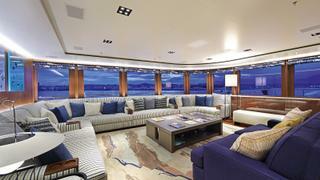 It’s a space that would feel grandiose in a townhouse, but on a yacht it is an extraordinary luxury. “The owner was very active in business at the time and wanted private rooms away from the guests,” explains interior designer Tino Zervudachi. 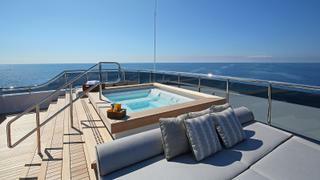 For my money, though, the VIP suite on the wheelhouse deck is the favourite. It is smaller, of course, but cosier, with a dressing room and ensuite bathroom. 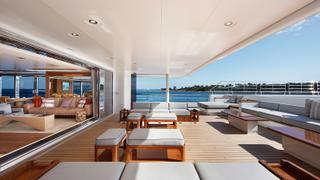 And the real draw is its own private aft deck, complete with sofa-style sunpads and an intimate dining area. 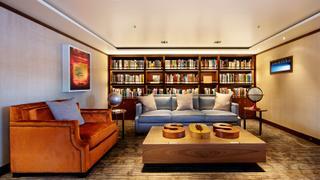 The finish is meticulous, with much of the furniture built by German luxury outfitter Fitz Interior. At its workshop in Bavaria, the company built each space for a detailed walk-through and to make any changes, before the whole interior was dismantled again and shipped to Italy for installation. 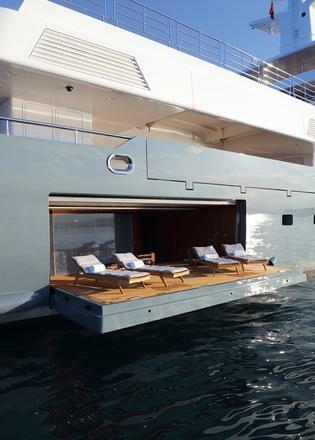 “We built the interior based on our substructure system, which allows every owner of the vessel to change the wall, ceiling or furniture cladding in no time,” says Fitz project manager Markus Jechnerer. Zervudachi led the interior design, based on experience gained during work on several of the owner’s homes. “There were a few words, not a proper brief,” he says. 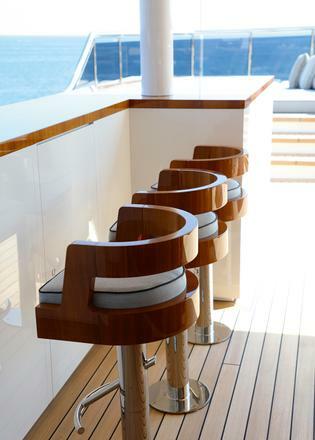 “I understand him very well, and he made it clear that the boat had to be extremely comfortable, but masculine and streamlined.” They sourced exotic woods and fabrics from across the globe, in reference to the yacht’s go-anywhere capabilities. The finish in each cabin is different, creating a subtle variation: American elm, tropical olive wood and wacapou. Each bathroom features glass panelling, again with varying tints to it. “We decided we didn’t want any marble on board,” says the designer. Elsewhere in the boat there is a wealth of textures and finishes that sit very comfortably together thanks to the restraint of MHZ. These range from the owner’s suite’s coveted African fabric for upholstery, woven in Dakar for Aïssa Dione, to a silk-linen blend from Twill Textiles on the walls in the guest cabins. Then there’s hand-woven abaca (from a Philippine banana palm) on the walls and ceiling of the main and upper decks, while limed oak and mutenye woods also appear in the wheelhouse and staircases. And the door to each guest cabin has a different colour of rich Garrett leather on the corridor side “to help guests more easily identify their own cabins – and to keep the interiors from being too serious”, explains Dennis Pyle of MHZ. How capable is this yacht? At her cruising speed of 14 knots, Planet Nine has a range of more than 6,000 nautical miles – thanks to the 340,000 litres of fuel she can carry. Slow her twin Caterpillar 3516 engines down to a perfectly respectable 10 knots and that range rises to more than 10,000 miles, enough to cross from Sydney to Ushuaia and on up to the Caribbean, without halting for fuel. “That’s including fuel for the generators,” says Captain Rob Williamson, who oversaw the redesign of the power systems to reduce the hotel load to a single 275kW Cat genset, although there are three aboard. Couple that with her ice class hull, 9,000 litres of aviation fuel (“around 10 times the range of an Agusta Grand”, says Williamson), 40,000 litres of fresh water, plus the ability to make around 18,000 litres more per day, and you can see she has phenomenal range and autonomy. Perhaps the limiting factor is fresh food. There is plenty of cold storage on board, down on the machinery deck in the bow, including several cold rooms and a walk-in freezer. “We can store luxury food for about a month,” says the captain. There’s storage for plenty more but after that you’d start relying more on tinned and ambient stored produce. So the effective range is a matter of taste for the owner or his guests. First published in the September 2018 edition of Boat International.